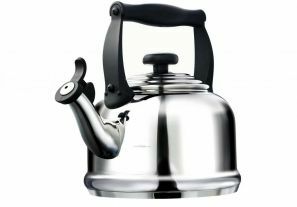 Nothing beats the aroma of freshly brewed tea or coffee; such an important daily ritual calls for a stylish stovetop kettle. Whether you prefer a traditional or modern design, our stainless steel stovetop kettles bring a stunning new look to our ever popular Kone and Traditional shapes. Each kettle is crafted from high quality 18/10 stainless steel with a sleek mirror polish finish, and is the perfect complement to your Le Creuset cookware. An encapsulated base allows for efficient heat transfer for optimum performance, and is suitable for all hob types including induction and cast iron stoves e.g. Aga. A whistle indicates when the water is boiling.